This entry was posted in Beth Ditto, Plus Size Clothing Reviews, Plus size DIY Size 28 by affatshionista. Bookmark the permalink. Thanks Stina, now to see if I can wear it in real life? LOL! I can’t believe that is a skirt it looks so good as a shirt… what a great idea!!!! Wow Affinity!!!! You look amazing in that skirt! Thanks you guys. I was sad when I bought it and it did not work, I am thrilled to wear it after it has been in my closet for so long. You have such fun with clothes! Thanks honey, so happy for your house, and yes the process is a pain. What a smart idea. Your looks are always so fun and upbeat, and those hearts are terrific! So much fun! I love everything about Beth Ditto too! I wish she would do more clothes! 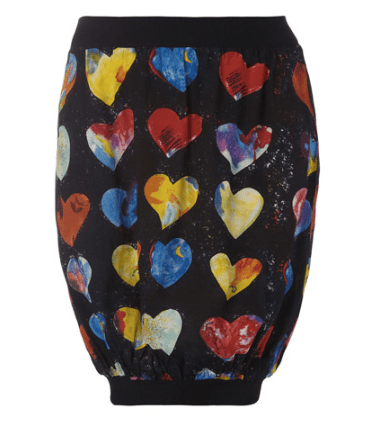 Fantastic reworking of the Beth Ditto skirt! You rock it as a top! Thanks for finally writing about >Ditto.Ditto.Ditto. Always Red Hot | affatshionista <Loved it!